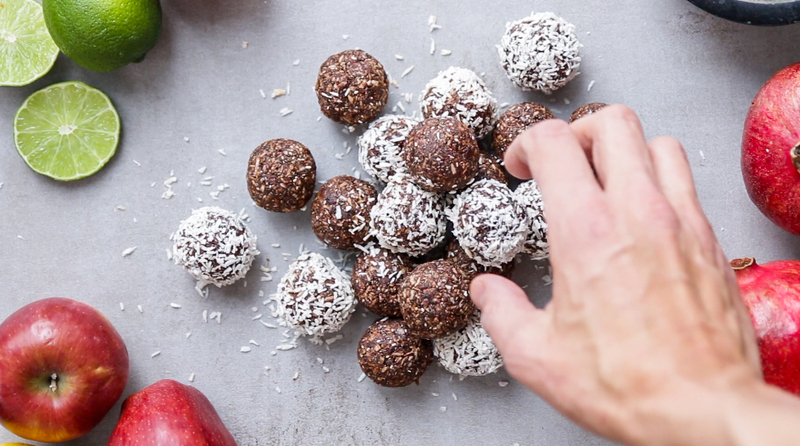 There’s nothing easier to slip into a lunch box than a few of these mega-healthy energy balls. Super easy to prepare, every single ingredient in them is a nutritional powerhouse! Drain thoroughly and add to a food processor. Add the remaining ingredients and blend for a few minutes or until mixture is smooth and holds together. Roll the dough into 20 bites, coat in grated coconut and refrigerate. Can be stored in the refrigerator for up to 7 days in an airtight container. I made the energy bites and can recommend them 100%. Suggest you make a double batch. Rolled half in cocoa powder and half in coconut. YUMMM! Did these tonight and it was so satisfying. Thank you! Made these tonight. Cut cocoa powder in 1/2 and replaced with TB each amla fruit powder and a 10 mushroom powder mix. Also went 2 TB each chia seeds and Flax seed powder. Coated a couple lightly in cinnamon for a change in flavor. These are delicious, and that perfect snack for in between meals. Thank you for the recipe! You can skip it no problem ! I like this and the veggies recipe for Berger. Cooking for diabetic. What is the sugar/ carb content? I made these today, and will brag about them to all my friends all day long tomorrow and probably for a long time, they are delicious! It’s too bad these “super” foods are not available easily everywhere. I live in Holland and it’s super easy, but my vegan brother lives in Colombia, and there’s no chance! I had dreamed of giving these to my kids, 4 and 6 years old, in their lunch boxes, but one doesn’t like chocolate, and the other doesn’t like coconut, so… they were a big fail with them. Any suggestions for changing the chocolate flavour? What type of maple syrup do you use? Just wondering if you use sweeten or unsweetened coconut. Can i replace the maple syrup with jaggery powder? I have a mini food processor and it couldn’t manage this at all. I had to stop it every 20 seconds to take the lid off and scrape the ingredients away from the edges. Is this normal? What make & model is your food processor, did you have similar problems?